Last year I got in a modest Twitter spat with Anand Sanwal the CEO of investor analytics company CB Insights. Anand writes a very amusing newsletter, has built a wildly successful business tracking venture investing (at $20-50K a client) and has recently taken on $10m in VC himself to build out his business which was already profitable. The spat was because in August 2015 (5 months ago) CB insights said that “Digital Health” investments totalled $3.5 billion in 2014. You can go read the article Stephanie Baum concocted from the Tweetstream but my point was that when CB Insights, a generalist analyst company, said that the investment in digital SMAC health was $3.5bn in 2014 they were wrong because 4 specialists (Health 2.0, Mercom, Rock Health and Startup Health) all said it was over $4.5bn. What’s a billion between friends? Not much, but what I left unsaid until now is that if they’re 25% off the average in one sector, where are they in the other sectors they cover? But other than a few amused readers of MedCity News no one much cared and the world moved on. Then everyone stared putting out their Q4 2015 numbers. Amusingly, but probably only to me, both Rock Health & Startup Health put out their Q4 numbers 2 weeks before the quarter/year ended, and missed a bunch of late deals! But by the time the revised numbers came in everyone was again in that middle $4 billion range and there was general agreement that funding was about flat in 2015 compared to 2014–albeit at a high level compared to what the Cinderella sector had been recently. 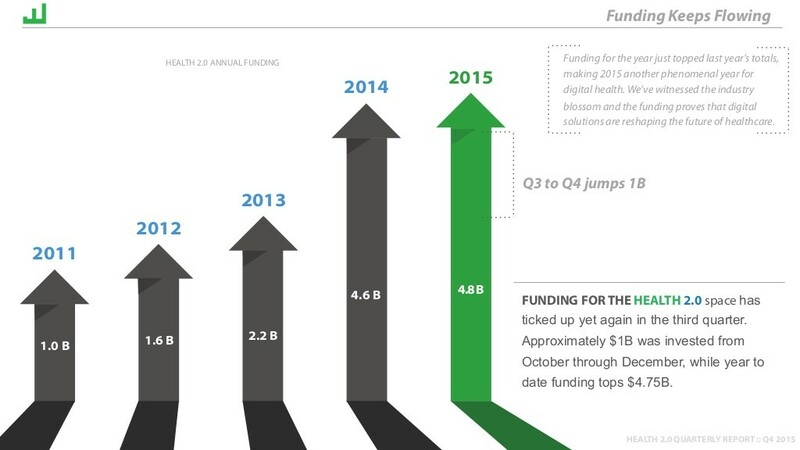 Health 2.0’s numbers in our report were $4.8 billion for the year, as shown on the left. (You can see more on these and some other data in our Q4 report here. In case you don’t know I co-run Health 2.0 as my day job and yes I own THCB). OK. All so far so ho-hum. Then as the other numbers started coming out I noticed something a little odd. CB insights came out with its numbers for 2015, but something was different. You’ll recall that I had poo-poohed their 2014 number shown as $3.477 Bn in their blog post here and displayed in the chart below. These are 2014 numbers shown in a post about investment in 2015, published in August 2015. And that was the number I’d started the original spat about. But when I looked at the post they released in January 2016, not only was the number for 2015 at $5.7 billion (remember Rock Health, Mercom & Health 2.0 all put it in the mid-high $4s) but the 2014 number had somehow climbed from about $3.5 billion to $5.1 billion. Again check the January post and check the chart I’ve lifted from it below. You’d think this was a curious jump and you’d be right. But nowhere in the post does it say why the total for 2014 in August 2015 was so different from the total for 2014 in January 2016. Of course being the troublemaker I am, I asked about this on Twitter and got a classic no reply from Anand at CB insights. So then I sent all this info off to Stephanie Baum at Medcity News thinking that she might like to write more about it. And a funny thing happened. Instead of writing the article I wanted her to write (i.e. this one!) She found yet another number for 2015 from CB Insights, and wrote about how they were now back in the pack with everyone else. Rock Health has been around since 2011 first as an accelerator and now as an early stage venture fund. Matthew Holt had a chance to sit down with Rock Health’s Managing Director Malay Gandhi ahead of his appearance at WinterTech to discuss how Rock Health looks at the consumer side of digital health, and what developments Rock Health thinks we’ll see in the near future. Matthew Holt: It’s Matthew Holt with Malay Gandhi. He is the managing director of Rock Health, and has been officially for what, nearly a year or so now, Malay? Is that right? Malay Gandhi: Since June, June of this year. MH: So about six months. Most of us know that Rock Health was founded by Halle Tecco and Nate Gross a few years back, 2011, and probably was the first and most influential of the incubators and accelerators that target health care specifically. Perhaps you can explain a little bit about how Rock Health works. Most people know that Rock Health is a nonprofit, and that you guys do a lot in terms of stimulating the ecosystem with small events, big events, and your reports on financing and so on. But you are mainly a fund and the amount of money that you invest in your companies has been increasing from I think $20,000 in the early days to $100,000 plus recently? Could you explain how that actually works compared to other accelerators or incubators? MG: Yeah. Essentially, the way Rock Health works is there are three big things that we do, all under our mission to support and fund entrepreneurs. We have our venture arm, which does seed investments in the companies now. We’ll write checks up to $250,000 per company, really at the seed-stage. We conduct research which we release publicly. Let’s say about four reports or so a year, as you mentioned, tracking funding, but also doing deep diving in various topical areas. Which Health Incubator Should You Apply To?